Tooling System is designed for thick turret punch presses. MXC(TM) tooling system consists of punches, strippers, and Slug FreeÂ® dies for Â½ in. A, 1Â¼ in. B, 2 in. C, 3Â½ in. D, and 4Â¼ in. E thick turret stations. Manufactured of DuraSteel(TM), MXC Punches feature minute back taper with near polished punch flanks to reduce friction and heat build-up during punching cycle. MXC Strippers, manufactured of 4150 tool steel, are designed with round edges to eliminate sheet marking, while Slug FreeÂ® Die design eliminates slug pulling. Anoka, Minnesota: Mate leads the punch press tooling industry with another tooling first - the new MXC(TM) tooling system. Designed for all thick turret punch press brands and models, the MXC system provides extra long life and tooling interchangeability benefits. "With MXC tooling, Mate now becomes the premiere alternative source for all thick turret tooling needs," reports Andy Spence-Parsons, marketing manager for Mate. "The MXC Tooling system brings to thick turret press users everything they need to replace existing tool components with Mate's proven longer life tooling, backed with its unparalleled reputation for high quality products, reliable delivery and service excellence." MXC Punches are manufactured of Mate DuraSteel(TM). Proven for its toughness and wear resistance, DuraSteel is air-hardened tool steel with increased vanadium and tungsten carbides. This unique steel formulation adds durability and increases wear resistance while maintaining toughness. Additional MXC punch features include a minute back taper with near polished punch flanks that reduce friction and heat build-up during the punching cycle. For extreme applications, Maxima® punch coating is available to further withstand abrasive materials and materials prone to galling. Two versions of the ½ inch A station and 1¼ inch B station punches are available. One version includes lubrication ports for compatibility with tool holders that integrate with machine tool lubrication systems. The second version for 2 inch C station, 3½ inch D station and 4½ inch E station punches are designed for use in both lubricated and non-lubricated systems. For maximum flexibility, all MXC punches are compatible with existing thick turret tooling systems including Mate's Ultra TEC® and Ultra XT(TM) tooling. MXC Strippers are manufactured of 4150 tool steel for added toughness and resistance to distortion during punching. They are designed with rounded edges to eliminate sheet marking and improve piece part quality. For maximum flexibility, they also are compatible with existing thick turret tooling. Mate Slug Free® Die Design eliminates slug pulling. This Mate feature eliminates completely the condition whereby slugs return to the top of the sheet during the stripping portion of the punching cycle. When this occurs, the slug comes between the punch and top of the sheet on the next cycle. This causes damage to the piece part and the tooling. Mate Slug Free dies eliminate this problem by featuring a constriction point below the surface so the slug cannot return once it passes through this point. Once the slug is separated from the punch, it is free to fall away from the punching area, thus eliminating slug pulling. "Mate's MXC tooling is an impressive thick turret tooling option," reports Spence-Parsons. "By combining highly durable punches for extended intervals between regrinds with tough strippers for continuous service and Mate Slug Free dies to eliminate slug pulling, piece part quality is maximized while tool life is extended. With global supply capabilities and 24/7 service, thick turret tooling users throughout the world can meet every tooling need with Mate." 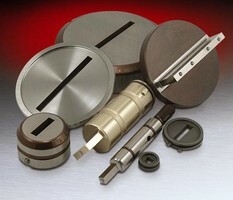 For more information on Mate's new MXC tooling system, visit mate.com/mxc. Or call for FREE brochure in USA and Canada, 1-800-328-4492. Outside USA and Canada, call 1-763-421-0230.